Did you know that ice cream was once considered a luxury? Or did you know that in early Greeley, it would have probably been enjoyed in the winter? Ice cream is such an iconic summertime treat, that it is hard to imagine someone would go to great effort and expense to have some during a Colorado winter. This was due to the difficulty of harvesting and storing its most essential ingredient, ice. Although ice houses may have been used as far back as 4,000 years ago in Mesopotamia, storing ice was difficult before the advent of electric refrigeration. Therefore, the creation of frozen treats took centuries to take off and anything resembling America’s most popular dessert did not appear until medieval times. At that time, Persians and Turks sipped on sharab or sharabt, what you might know as sherbet. The trend soon picked up in Europe, and Italians became exemplary producers of the concoction, often spiking them with wine or spices. In the 17th century, Antonio Latini was credited with writing down the first sorbetto recipe. By the 18th century, people enjoyed these expensive treats in stylish shops throughout France and Italy. In 1775, a book by a Neapolitan physician promoted eating frozen desserts for your health: cinnamon-flavored would help with pain, lemon could sooth your stomach, and chocolate might improve your mood. This still seems like sound advice and perfectly legitimate reasons to go enjoy a scoop. With the popularity of ice cream rising and also reaching the American colonies, freezing methods improved. In 1843, Nancy Johnson received a patent for a mechanical ice cream machine. Prior to Johnson’s ‘artificial freezer’, the pot freezer method was used. Cooks would place sugar, cream, and flavorings into a container fitted into a pail filled with an ice and salt mixture. The cream was shaken up and down while beating it and scraping it from the sides. This difficult process took a few hours to make ice cream. With Johnson’s process a crank turned a ‘dasher’ which scraped and churned the cream, making ice cream in mere minutes. Where did all of this ice come from? Ice harvesters cut ice blocks from lakes and ponds during the winter months. In 1886, at the peak of the natural ice boom, over 25 million tons of ice were harvested in the United States. 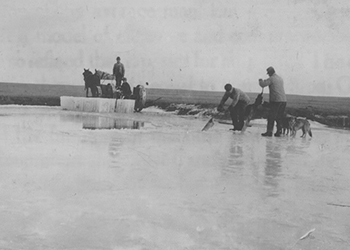 In Greeley, most ice was harvested from Seeley Lake and stored in ice houses insulated with straw or hay. In 1871, Captain Abbott of Greeley claimed to store 200 tons of 16-inch-thick ice in a structure insulated with a 2-foot thickness of hay. In 1898, the Greeley Ice and Storage Company opened its factory doors. Their slogan, “Artificial Ice, Absolutely Pure”, advertised the purity of its ice due to their thorough filtering process. This marketing tactic aimed to compare its product with ice from Seeley Lake that was sometimes brown with chunks and contaminates. By the 20th century, and with the advent of electric refrigeration, ice cream soda fountains popped up in department stores and cafes around the country, including in Greeley. 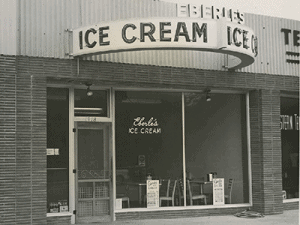 Eberle’s Ice Cream Store circa 1960. The storefront was located at 1718 9th Street.